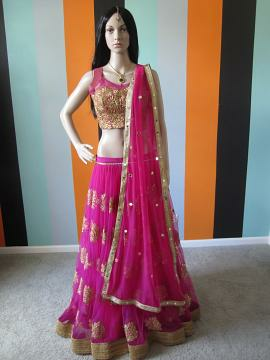 Pink net fabric embellished with heavy embroidery and kundan work lehenga. Accompanied by an embellished embroidered sleeveless choli ( extra sleeve attached if needed) and net fabric with mirror work and gold border pink dupatta. Slight color variation may occur due to photographic reasons. The size of the choli is 32 can be customizable upto 36 inches. Lehenga Waist is 32 can be customiable upto 34. Length of Lehenga is 42inc. Fabric used is 5 meters flare for Lehenega. This item in Lehenga Choli & Ghagra category was first added to our catalog on 08-10-2017. Buy Designer Eye Catching Wedding Wear Pink Lehenga Choli, sold & shipped by Elegant Attire where you can shop online for Bespoke Designer Indian Fashion Clothing for Girls and Women. This Lehenga Choli collection has been tagged as Lehenga, Choli, Pink,party,wedding,bridal,silk,net,embroidery,kundan.